Narcotics Anonymous (NA) is a twelve-step program where people who are addicted to drugs can find support in recovery. It is a group of recovering drugs addicts helping each other to remain clean. The NA literature describes it as a program "for addicts who wish to pursue and maintain a drug-free lifestyle." There are local NA meetings available daily throughout the United States and in hundreds of countries throughout the world. Many people find the support they need to stop using their drug of choice. It is a good, safe place to turn to when you need help and want to get clean. Narcotics Anonymous was founded in 1953 and is often simply referred to as "NA." It is a global organization of recovering drug addicts with 67,000 locally-organized meetings in 139 countries. There is not a focus on any particular drug. Instead, the purpose of NA is to share the trials and triumphs that come with addiction and recovery. NA is a twelve-step program similar to Alcoholics Anonymous (AA) and it shares many of the same principles, practices, and philosophies. The goal of NA is to create a community where addicts help each other on the road to recovery. Meetings include people of every demographic and at various levels of recovery, from many years to just a few days of being clean. Like AA's "Big Book," NA uses a primary text called the "Basic Text." Members use this book as a guide for recovery along with the fellowship, experiences, and advice of other members. It is common for a new member to develop a relationship with a "sponsor." This person often has a longer period of being clean and feels comfortable helping other addicts work the twelve steps. No part of NA is compulsory or required. Meetings are either "open" for members and non-members or "closed" to members and prospective members only. 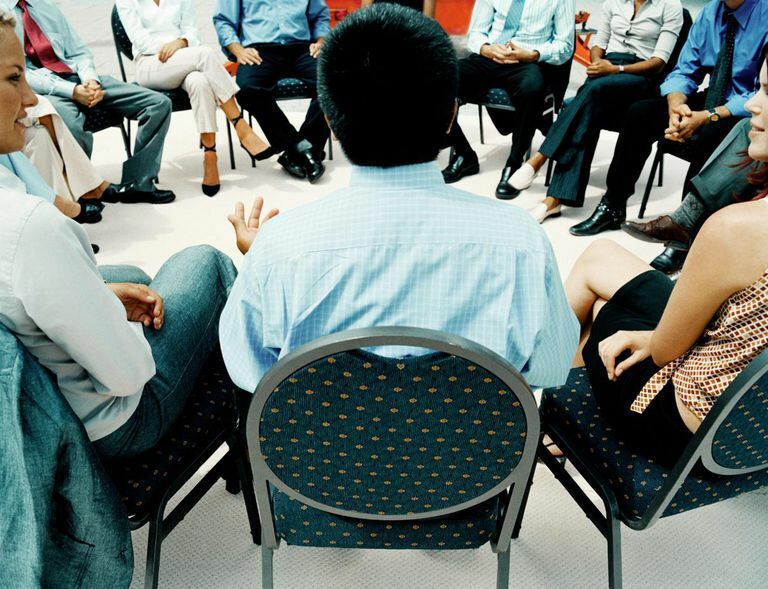 Visitors who are not addicted themselves are invited to attend open meetings. There are also no costs to attend a meeting and non-members are asked not to contribute to the voluntary collection of money that keeps things running. This allows the organization to remain "self-sustaining." You can, however, purchase a "Basic Text" at the group's cost. Anonymity is key to NA's success. Members understand and agree that what is said in meetings and who they see there remains at the meeting. They do not discuss these details publicly. This creates an environment of security where everyone feels comfortable to open up and share their experiences and feelings. The only requirement for becoming a member of Narcotics Anonymous is "the desire to stop using." For many members of NA, the program is the only thing they've found that actually did work. Anyone who has dealt with addiction knows that it is a struggle and one that can seem hopeless at times. Treatment centers and rehab, therapy and counseling, and going at it alone does not work for many people. For some, NA is a continuance of rehab in real life. For some reason, the community support and twelve steps found at NA meetings seem to be the missing link for many addicts who wish to stay clean. Of course, there is never a guarantee that you will never use again. However, as they say in NA, "We can do together what we could not do alone." Everyone is nervous to attend their first meeting. You can rest assured that everyone in the room has been in the same place and the majority are very welcoming to newcomers. Meetings vary a bit because they're directed by the local members, but there are a few common things you can expect. You will hear the word "addict" often at NA meetings. This is how NA members refer to themselves. Addicts include those who use everything from heroin and cocaine to prescription drugs and a variety of other mind-altering substances. Meetings typically follow one of two formats: speakers or open discussion. In a speaker meeting, one individual is allowed to speak at a time to share their personal story. An open discussion is like a round table where everyone can share their own experiences in a limited amount of time. Often, there is a specific topic or a reading from the "Basic Text" that serves as the foundation for discussion. As a newcomer, you may be asked to introduce yourself. When doing so, use just your first name as this is part of the anonymous aspect of the group. Also, you do not have to say "I'm an addict" unless you feel comfortable doing so. The only rules in a meeting are that drugs and paraphernalia are not allowed. Also, cross-talk is discouraged and members — particularly new attendees — are encouraged to openly listen while others are speaking. It's also appropriate to turn off your phone and not have side conversations. What About God and Prayers? When you're new to NA, the talk about God and the inclusion of prayers at some meetings can be alarming, particularly if you are not religious. NA is not Christian or affiliated with any religion, government, or any other organization, even if the meeting is in a church. Within the Twelve Steps of NA, members are asked to admit they are powerless and that their recovery relies on a "Higher Power." This can mean a variety of things and is a very personal decision. Some people choose God (in whatever form or belief) as theirs and others do not. NA says that "ours is a spiritual, not a religious program." Try not to let this deter you from meetings. Instead, ask a member about it personally and they can explain further. When you are ready to attend your first meeting, visit the Narcotics Anonymous website to find a local meeting. Meetings occur at various times of day and almost every day of the week. Depending on where you live, there should be more than enough options to choose from. If you attend one meeting and are not too sure about it, go to another one. Every meeting has its own atmosphere and you might find yourself more comfortable in one group than another. That said, at first, it's hard to feel comfortable because you feel like the outsider or the newbie while everyone else seems to have it all together. This is not necessarily true and, as they say in NA if you "keep coming back — it works."